Apple's macOS Mojave is coming this Fall, and it's bringing Dark Mode, a feature that users have requested for years. 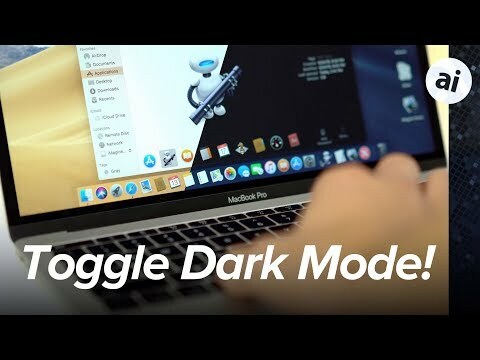 AppleInsider shares one way to make it easier to turn Dark Mode on and off, without needing to enter System Preferences every time. We're currently on the first beta of Mojave, and Dark Mode looks great, but it's a little bothersome to switch in-between both modes. To switch to and from Dark Mode at the moment, users have to enter the System Preferences, select General, then select their desired mode. By taking advantage of Automator, we can create a custom script that will allow us to toggle between light and dark mode with a simple keyboard shortcut, or a button on the MacBook Pro's Touch Bar. Credit goes to Thomas Verschoren for coming up with this idea. To get started, open the Automator app, and click New Document. Select Contextual Workflow and click Choose. In the WorkFlow input selection dropdown menu, choose No Input. If you have a TouchBar, you can also change the image that'll be used for the button. Within the Actions search bar, type "Apple" and double-click on Run AppleScript. Go down to the script box, select all, and delete. You can test out the script by clicking the Play icon. If Dark Mode switches on and off, the script works. Go to File, click Save, and name it Dark Mode, or another appropriate title. Open System Preferences, click on Keyboards, then go to the Shortcuts tab. Click on Services, and look for Dark Mode at the bottom of the list. Make sure the box next to Dark Mode is checked, and click on Add Shortcut. Enter the keyboard combination you want to use. Note that it will not override global shortcuts, like Command-X, so you will need to experiment with different shortcuts until you find one that works. For this example, we mapped it to Command-B, but it wouldn't work until we set the Send File to Bluetooth Device to use a different key combination, as that shortcut was already in use. When this keyboard shortcut is used, macOS automatically toggles between light and dark mode. Take note that it won't work in other apps that are using the same shortcut as you are. For example, iTunes uses Command-B to hide the column browser, so the above won't work while iTunes is the currently-used app..
Head to System Preferences once more, click on Extensions, then select Touch Bar. Make sure the Dark Mode workflow is enabled. Go back to Keyboard settings and click Customize Controlstrip, which will be available if you have a Touch Bar model. You should be able to drag your Dark Mode workflow onto the Touch Bar. Once added, a simple tap of the button will toggle Dark Mode on. AppleScript syntax looks ridiculous. In an attempt to make it user friendly, it's really not. Why not just switch to Swift syntax? Looks much more standard and looks way more friendly. Thanks! Now all I need to do is figure out how to tie this to Night Shift and/or ambient light results. I hadn't heard about this ability for Automator to be added to the Touch Bar. Huge step in the right direction. I'm a (rare) huge fan of the Touch Bar, but it's all due to Better Touch Tool customizations that are outside of Apple's designs. What is this Swift syntax for Automator that would be more "friendly" than AppleScript? See the problem? These all "look" fine, but only the first one actually works. I don't see a solution outside of AI's using AppleScropt. If Swift is more "friendly" then what is the workflow to create it using Swift over AppleScript? some pedant can ding me for systemPreferences being an optional… point is, there would be a correct, unambiguous way to say this. It only looks like it is easy to align syntax, but when you consider purpose things become different. Your videos are awesome. Thanks for the tips and keep them coming. AppleScript has been around for a while but is very under utilized. Glad to see AppleInsider bring it into the spot light again. Do not squeeze languages into the same bucket based on syntax. It is not smart idea as they are processed by OS differently and require different ooptimizations if any. That is a good point, but I still argue that basing a programming language on a spoken language is an inherently flawed idea. It is user friendly once you know the rules of syntax. Why is that different from English rules? Record this: “hey Siri, turn on the dark mode” with your own voice and play the sound clip whenever you want to enter dark mode. Doesn’t it work? followed the exact same process to get dark mode using a keyboard shortcut and it got an error message and clunked out .. It works in automator ? Thanks - but still need help. Got the script to run, save, even got a keyboard shortcut - it works fine. Couldn't find a shortcut that I didn't hate, though, and want a touchbar button. I can not get that to work! So frustrating. Any ideas? The button is in workflow button can we put the dark mode directly on the Touch Bar?